Oh I love turkey on Thanksgiving . Seriously, I am a blessed girl. And, I am truly thankful for every single one of you. 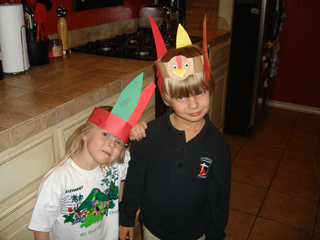 Happy Thanksgiving from our turkeys to yours. Awwww, John Henry & Anna are scrumptious! lol ! Love you! HAPPY THANKSGIVING…..AND WE GET TO EAT YOUR DRESSING….YOU ARE A SWEETIE WOMAN….LOVE YOU ALL…..
i hope you and all of yours are well. say hi to your folks, and please tell them we think of them often. your kids are cuties. HAPPY THANKSGIVING TO YOU GUYS ALSO!! !